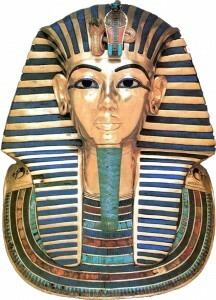 Tutankhamun (also spelled Tutenkhamen) is the most famous of all pharaohs. He was the son and successor of Akhenaten, grandson of Amenhotep III and Queen Tiye and great-grandson of the royal matriarch Queen Thuya. Archeologist Howard Carter’s opening of his intact tomb in the Valley of the Kings in 1922 ranks among the most splendid discoveries of history. In 2010, genetic fingerprinting of his mummy determined that he died at the early age of 19 as the result of violence or an accident to which the incestuous relationship of his parents and several genetic defects contributed. Tutankhamun actually carries a “double dose” of the allele named for him. Like most of the other genes in the family, it is Central African in ancient origin, but unlike the other markers it has a sparse distribution outside Africa with a worldwide average frequency of 4%. Still, Africans and African-influenced populations (1 in about 10) are about twice or three times as likely to have it as non-Africans. 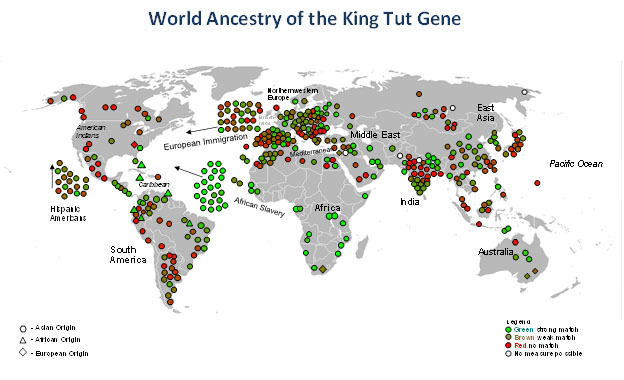 Also African in its ultimate source, the King Tut Gene finds modest distribution in East Coast American Indians, the Himalayas, Northeast Europe and scattered other populations, including Jews.